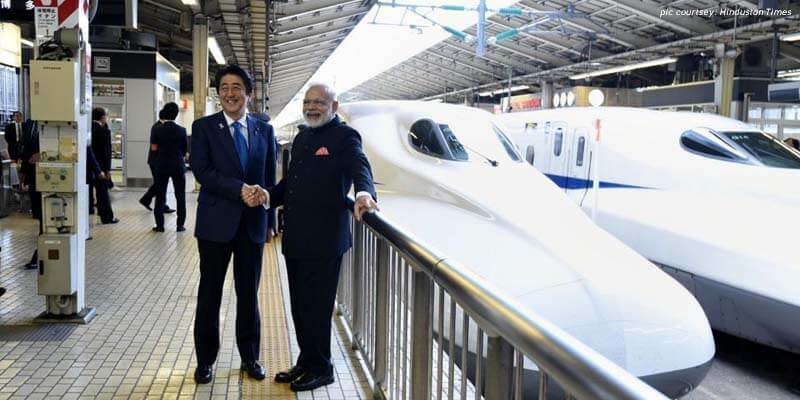 Bullet Trains in India: In September 2017, Prime Minister Narendra Modi and his Japanese counterpart Shinzo Abe laid the foundation stone of the ambitious bullet train project – connecting Mumbai with Ahmadabad. There are arguments for and against adopting bullet trains in India. Does India really need bullet trains? Let’s see. The Shinkansen high-speed trains of Japan are colloquially called as bullet trains for their appearance and speed. It is a term generally used to describe a high-speed train of speeds above 250 kmph. 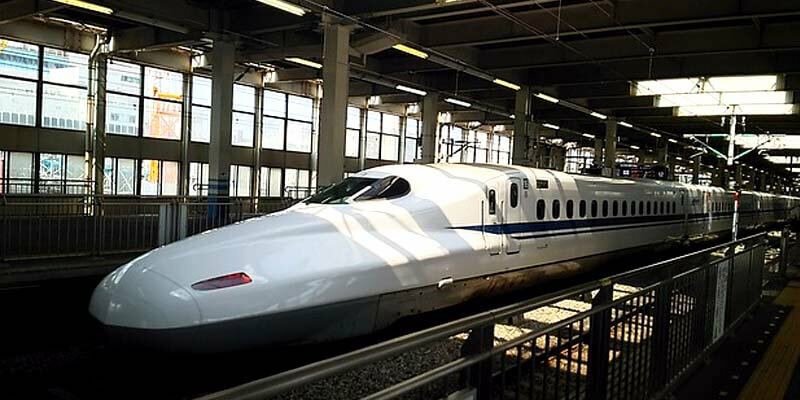 India’s first bullet train will run in the Mumbai and Ahmedabad high-speed rail corridor, whose construction began in September 2017. It is a 508 km long high-speed rail corridor building with the help of Japan. The train will run at a speed of 320kmph and is expected to be completed by 2022. The 2009–2010 Rail Budget of India introduced the Mumbai–Ahmedabad corridor and 5 other high-speed rail corridors for a feasibility study. India currently does not have the indigenous high-speed rail technology. The technology is provided by Japan and also 81% of the project cost is financed by Japan at an interest of 0.01% for 50 yrs. According to an analysis done by World Bank regarding the costs of High-Speed Rail (HSR) projects in different countries, rail infrastructure accounts for 82% of the total cost. The cost of Mumbai-Ahmedabad HSR project is nearly $27.44 million per km compared to the $17-21 million per km of China. China is not dependant on the Shinkansen technology and although a late entrant, the HSR projects of China are cheaper than those of Japan. In 2015, China has won a project in Indonesia against Japan for its cost competitiveness. The loan and interest rate by Japan which seems quite tempting at the first look is not actually so. The Japanese Yen is projected to appreciate against the Indian Rupee over the period questioning the viability of the loan and the project on the whole. What are the Pros of the project? Having an alternative mode of transport will decongest the roads. Also, the speed of bullet trains will save the time and boost the businesses in large cities where time is money. The interconnectedness between the towns and cities would reduce the hassle of commuting thereby helping in reducing the migration. Safety has been one of the major concerns of Indian Railways. The record of bullet trains in the field of safety has been impeccable. The Shinkansen trains of Japan started in 1964 report no fatalities till date. In today’s global environmental scenario, any step which checks the pollution is welcome. The emissions of CO2 per passenger km from speed rails is way less compared to that of automobiles and aeroplanes. It emits an eighth and a fifth of emissions respectively. It will help in the infrastructure development thereby spurring the economic growth and creating huge employment opportunities. What are the Cons of the project? The Mumbai- Ahmedabad high-speed rail costs around one lakh crore Indian Rupee. Considering the cost overruns due to delays and future fluctuations of inflation, it may further get increased. It is estimated that the fares may range in between Rs. 4000 to Rs 5000 to make the running of trains economically viable. Such fares would be affordable only by the rich who might prefer air travel considering the lesser margin of fares between them. However, most of the travel by trains in India is done by the poorer sections. It might act as another obstacle delaying the project and also causing large-scale displacement of people. What are the arguments against Bullet Trains in India? The Indian Railways is in a worrying state.There is a need to strengthen the present infrastructure of the railways. The recent number of increasing rail accidents and the Elphinstone road station stampede further strengthens this case. The recent report by the Standing committee on Railways headed by Sudip Bandopadhyay said that in 2014-15, about 40% of the accidents occurred at Unmanned Level Crossings and in 2015-16, about 28%. The committee also recommended a complete shift to LHB coaches to minimize the loss of lives in case of derailments. Thus, the argument is, instead of strengthening and upgrading the current infrastructure keeping in mind the safety of millions of passengers, why invest in a project catered to the well-off sections. There is no denying the fact that safety considerations are to be kept in mind and accorded high priority. However, comparing these two investments in not right. These should not be considered as alternative choices. Investments should be made for renovation and up gradation as well as in the bullet trains project. India aspires to become the third largest economy in the next 25 years. It has already proven its prowess in the field of space and now is the time for furthering its international stature by joining the exclusive club of nations having a high-speed rail network. Everything will have its array of pros and cons. It lies in ones’ wisdom to weigh them equally and choose the path. The technological development comes at a cost but the safety of our citizens should not be a value added. What they are going to replace,I wonder.The common man’s choice of travelling in conventional trains or aeroplane boarders .I think none! They are only going to secure a vote bank for modi government by highlighting the failure of INC to procure bullet train for India.Common man’s aspirations are always compromised.The expense on the bullet train should be used to strengthen the education system,poverty eradication,road construction etc primarily in remote areas. Although the main concern is the cost of the project,1,10,000 crore is definitely a huge sum; but we cant deny the importance of this project. First of all it will boost the relation between two country. Secondly we are going to comepete in a world where, one day, efficiency and time will be everything. 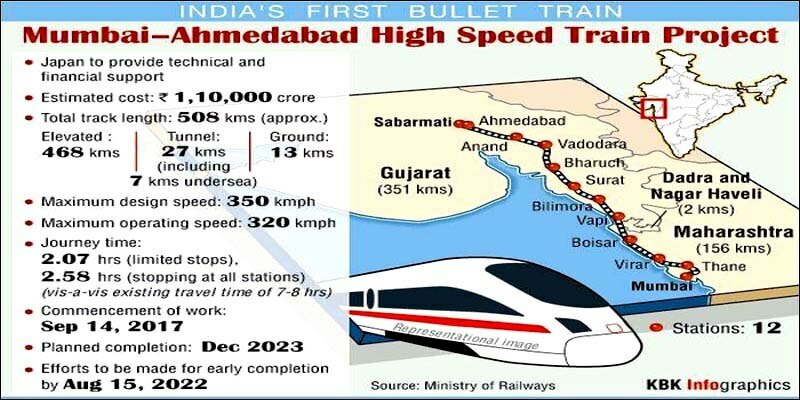 3rdly this bullet train project will incubate the technolgy of high speed train in India and so on. Another important aspect is that introduction of bullet train will create more than 50k jobs. Moreover the ageing coal and diesel engines of indian railways needs to be replaced. Coal based engines are only used as Heritage Purpose. No commercial train uses coal based engines.